I never really thought primer was too important but started using it two years ago and I will never go back. You put on your moisturizer, sun block and then primer in your beauty routine. It basically lays down a smooth foundation to apply your makeup on and also helps with your complexion. There are six different colors of the primer to help with red or yellow undertones, acne prone skin or to help brighten up your complexion. 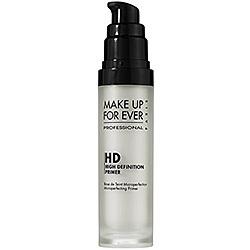 I personally use HD Forever Primer that is a pale blue to help make your skin brighter. The formula goes on smooth and leaves my skin matte which I like because I tend to get shiny and also my skin looks radiant because of the coloring. My makeup goes on better and stays longer. Also, unlike some I have used this formula does not break me out at all. You can find this product at Sephora and it runs around $32. According to the products details on Sephora’s site it, “ deeply nourishes, moisturizes, and softens the skin, creating a glowing effect. Creates a protective layer on the skin allowing foundation to glide on easily and last longer.” I full heartedly agree with this explanation. Bottom Line: Use it every time I wear makeup, can’t live without it.